Egyptologist Walter Brian found the mystical ancient artifacts, that seems to be the parts of some unknown mechanism, during the inspection of the tomb of ancient Egyptian official Sabu, who lived about 3100 – 3000 BC. Burial is near the village of Saqqara. Sabu’s father was Pharaoh Aneddzhib – the fifth ruler of the first dynasty of ancient Egypt. Presumably, he was a governor of the province or city. In the burial chamber of a mysterious artifact was a wide variety of vessels, stone knives, arrows, brass instruments and a few fragments of bowls made from schist. 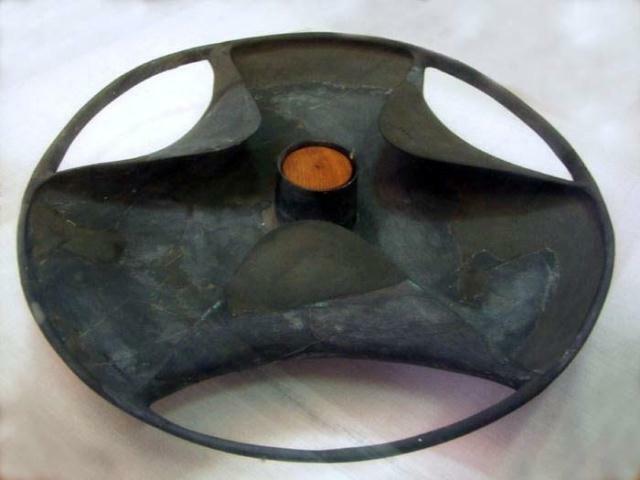 Disc of Sabu is 24 inches in diameter, thickness at the center is 4.2 inches, and the edges – 0.4 inces. This artefacts was made from very fragile material which requires great skills from te master to make this disc. Historians have a lot of questions that could change our understanding of history. For example, what was disc of Sabu intended for? According to scientists, this is not the wheel, as it appeared on the territory of ancient Egypt only in 1500 BC, during the reign of 18th dynasty. But if this a wheel, it means that it appeared in Egypt around 3000 BC, and Egyptologists would have to rewrite some historical works. Another assumption – the use of such a complex and delicate work means that the object had a ritual or even religious significance. According to other experts, this could well be the leg of an oil lamp. However, this version was criticized because Egyptians didn’t use trilobate ritual lamps, so this disc likely to have functional, not decorative use. According to another version, this artefact could be an integral part of some ancient technology. According to Egyptologist Cyril Aldred, the shape of the object proves that it can be a copy of the other probably metal object that is older than this one. But why did ancient Egyptians create this strange object more than 5 thousand years ago? How could they so accurately made such complex shapes on a fairly brittle material? It is possible that five thousand years ago disc of Sabu had an important role. However, now scientists can not explain its purpose and complex structure. If you like this sensational information, share it with your friends!